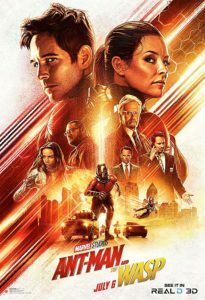 Ant Man and The Wasp is set just prior to the events of Avengers: Infinity War¹, which allows it to revel in the same comedy/adventure realm as Ant Man and Thor: Ragnarok. It excelled at said revelry. My own favorite moment, which I shall not spoil, was when Luis (Michael Peña) gave someone his trademark high-speed recap. I was downright giddy when I realized that the scene was setting it up, and the remainder of the scene did not disappoint. There were plenty of epic super-hero moments, too, and they struck that perfect balance between humor and heroism. Ant Man and The Wasp clears my Threshold of Awesome², and the soundtrack is going into my music library. ¹ The after-the-credits scenes establish the sequence of events between the two films, and they offer a couple of hints about how Ant Man might play a significant part in Infinity War Part II. ² It takes my top slot, displacing Black Panther, because as brilliantly awesome as Black Panther was, I had more fun watching Ant Man and The Wasp. YMMV.